As a Freshman at Penn, I recall being in awe of everything: living in a bustling city, taking the bus to Center City, meeting students from around the world, having awesome roommates, feeling extremely homesick at the beginning, experiencing insecurity about my writing, being challenged in my classes, making lifelong friends, and the list goes on for miles. There were moments of frustration and more moments of success. Deciding on a major was a big deal, selecting interesting, diverse classes was often an exercise in logistics as much as finding courses that would blend the right amount of challenge with fun. Everything felt new, fresh, exciting, invigorating! At the end of my Freshman year, I remember discussing my Sophomore classes with my grandfather, also a Penn alum. Pops was always enthusiastic about my education and supported my ideas, not to mention being a super-fan of Penn, driving down to Philadelphia from Connecticut many weekends for football games at Franklin Field or catching a basketball game at the Palestra and taking my friends and me to dinners. These visits were so special and unique. Well, anyway, Pops and his wife Sherrie and I sat down and compared various course descriptions and he asked how one class might be more useful or another one may be more thought-provoking. Being a wise 19-year-old, I had my work cut out for me. I knew what to take and how to orient myself to Penn because I’d already lived through my Freshman year, I was a pro at this college thing by then. It was shocking to hear Pops remind me that I “would still be a Freshman! And that [I’ll] hopefully always be a Freshman.” The nerve! How dare he superstitiously suggest I would not pass my classes or matriculate to my Sophomore year. Turns out, that’s not at all what he meant. He lovingly explained that we are always “freshmen.” Huh? Even when we are comfortable and familiar with the protocol of one thing and may have even gotten some experience doing that thing, a wrench is often thrown in the mix and we have to adjust. In other words, no two situations are alike and when being faced with a change, we have to adapt. Yet, these adaptations are new beginnings, thus we are “freshmen.” So, when I passed my Freshman year and moved into Sophomore year, I was afforded a multitude of new experiences: living in an apartment with friends, cooking meals, having more pressure to do well in classes (since we weren’t coddled or considered Freshmen anymore), social planning, study abroad applications, etcetera. Though I’d mastered Freshman life, now I had to figure out how to be a Sophomore. In fact, I felt like a newbie all over again. And the same thing happened all four years of college. Each time I felt like I’d figured it out in the fall, the spring semester would begin. Every new school year was an opportunity to have familiarity with campus, yet newness in my living situation, my classes and professors, or the activities in which I participated. Quite frankly, this “freshman” experience has been a theme in my life forever, whether by choice or by circumstance. There are always so many first times. Many situations may be similar or the context can be familiar, but rarely (never?!) is it ever exactly as it was before. There are so many variables and other moving parts that in each aspect, we are drawing from past examples to orient our minds. It can be crazy making. For me, there are times when I’m still a “freshman” but have resisted the learning. I’ve made efforts to separate myself from pain or reckless people, unhealthy or unsafe experiences. Instead of bending with the wind, I resist and snap. I’ll have been cocky and thought I was experienced to make smart decisions on my own using just my head, but really I’m engaging in Ferris wheel thinking: I go around and around and can’t get off the ride. I think I see so many differences that seem necessary to explore, when really the patterns are set. In other words, I haven’t looked at things with a beginner’s set of eyes. If I’d have looked at one whole year of my life with my “freshman” eyes, I would not have been in an habitual cycle for so long. To speak less cryptically, here are two examples of me, now, being a “freshman.” The first is actively choosing to move 30 miles from my friends and comfort zone in an effort to take a risk and get a fresh perspective. As most of my readers know, I moved from my neighborhood and apartment that I lived in for over six years to a place where I know fewer than five people. I felt stale and stagnant in my old life so took a giant risk and decided to see what could change with a new address and a belief in self-reliance. Tons changed. I’ve reminded myself that I can make things happen, I’m pretty good at making new friends (though it’s slow-going), and I have what I need right here. If you recall from the post entitled “Missing You“, I really miss my dearest friends and am still not sure where home is. However, I’m proud of the fact that I took the risk and am seeing my life and all of my choices with fresh eyes. The second way I’m a “freshman” again is through the lens of love and angst. A few years ago, I vowed not to have another breakup. Ha! Wouldn’t that be wonderful?! I had a lengthy breakup (as you know from the posts recently), and spent months recovering from it. Though I’d had other heartbreak in my life, this one was unique. I tried comparing the scenarios, but really couldn’t. So here I was, crying again but it was so different. This one encompassed mistrust and betrayal, while others had benchmarks of growing apart or no longer connecting. My “freshman” eyes and raw heart felt ill-equipped to handle it at first. And then, I realized I could rely on inner strength to conquer even the worst of the nights and needed to stop comparing and start seeing myself with a beginner’s mind. This took discipline and an attitude of openness mixed with faith. It seemed to be working, but what exactly was I doing? Turns out, there’s a word for it. 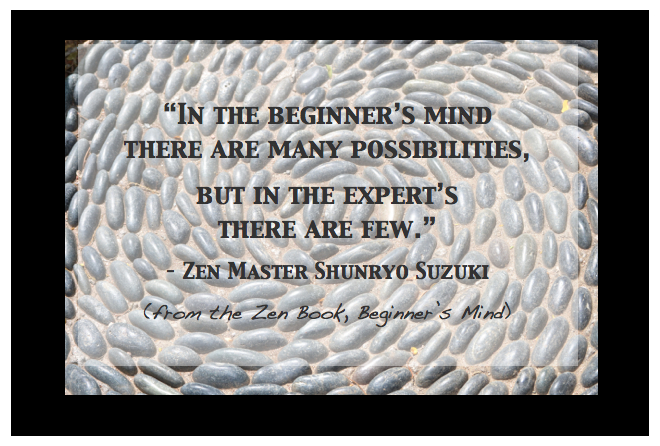 “Shoshin” is a concept in Zen Buddhism meaning “beginner’s mind”. It refers to holding an attitude of openness, eagerness, and lack of preconceptions when studying a subject, even when studying at an advanced level, just as a beginner in that subject would. My grandfather did not study or practice Zen Buddhism, yet he probably would have loved this concept. In the examples of my own fairly recent “freshman” experiences, I also channeled Pops. I considered how he would react in either of these situations (and found out from my mom that he’d lived through two similar life events). Pops was a brilliant person, having graduated high school at age 16 and went to college at 17. He served in WWII in the Army and was well-regarded by everyone who knew him. One of the most special things about him was that he lived life seriously. He didn’t exaggerate his accomplishments or speak with hyperbole. Rather, he was humble and used his open eyes, warm heart and logical mind to make decisions that served him well. He utilized curiosity to make choices and asked the right questions, even when the answers would be tough to hear. He reflected inwardly and expressed himself outwardly. He stayed focused with discipline and forethought. His “shoshin” governed many of his decisions and helped him grow and move on. Pops took on a beginner’s attitude, even in times he was an expert, so he could see all angles and evaluate problems omnisciently. I’ve been practicing “shoshin” too, having learned how to assess problems more objectively from Pops. I’ve intertwined my familiar and newbie experiences with “freshman” eyes full of wonder and openness. Applying this concept, I’ve learned to really see and feel things for what they are, not what they could be, asking myself difficult questions and listening to the real answers. Taking a position as a “freshman” or a beginner, I am available to receive and learn, not be the expert in a situation. Since my Freshman year of college, this curiosity has given me wisdom and freedom to not already know, but to live with possibility that each time is a first. Great article, I really love the authentic way you’ve displayed this part of your life and Pops. After many many setbacks in my own personal life it’s refreshing instead of getting down on yourself, to think always as a beginner or “freshman” . This really keeps everything mysterious and it also keeps the mind and soul open like a dry sponge ready to soak up the knowledge adventure. You’re welcome. Thanks for reading and commenting. Great post Nina. Always a good reminder that this life is always changing and we can always be learning. It all depends on how we choose to look at in and open our minds and eyes. Thanks for sharing. As all are, this is a great read. I have never thought of the ‘freshman’ way of thinking… Life truly is being a freshman over and over again. If I could grown and learn along with coercion obstacles as you have, I would feel great about it. If I could grown and learn along with overcoming obstacles as you have, I would feel great about it. You CAN still grow and learn and continue to overcome obstacles! You’ve made huge leaps in your life and have probably had to examine your old ways versus how you want to be. Thanks for the comment! As you know I always love reading about my dad, your grandfather, Pops. Yes, words of wisdom, indeed, and I often turn to thoughts of ‘what would pops say’ when I need help! Thank you for remembering?